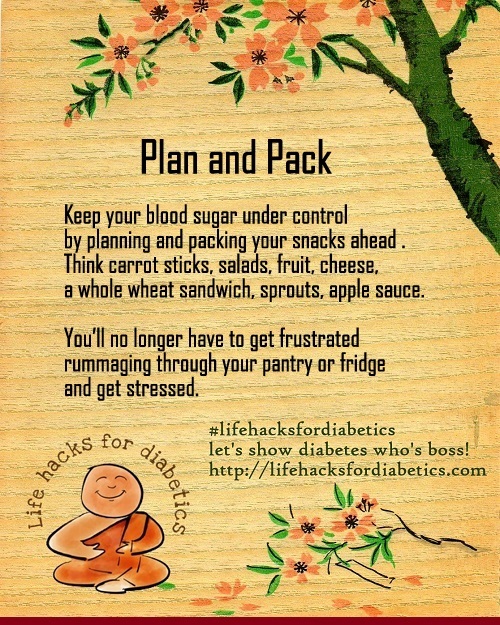 Keep your blood sugar under control by planning and packing your snacks ahead. Think carrot sticks, salads, fruit, cheese, a whole wheat sandwich, sprouts, apple sauce. You’ll no longer have to get frustrated rummaging through your pantry or fridge and get stressed. P is for Plan and pack your snack! I’m not sure how I missed your blog earlier… my son is a Type 1 Diabetic. He was diagnosed on the day after his 10th birthday. He’s handled it, like everything else thrown his way, like a Champ! Champ is indeed right, Mee! Children are amazing. We had two kids in our building who were juvenile diabetics and it would break my heart when they attended birthday parties and watched while the other kids gorged on cake and all those goodies! These girls are smart young ladies now who are doing very well!